I picked this one up on one of those ten-films-on-two-disks malarkey's in Walmart. 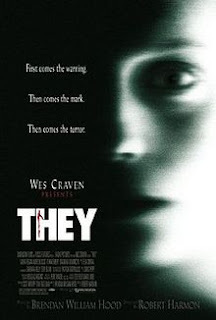 "Wes Craven Presents". It never sounds good, does it? On face value this had no right to be good. Beginning some twenty years previous, little Billy Parks has a monster in his closet, only no one will believe him. It's a strong start. Young Billy, played by Alexander Gould (voice of Nemo, Find Nemo) gives a strong performance from a young actor, 8 at the time. The opening is, honestly terrifying, ranking up there with openers like Nightmare on Elm Street. Cut to 20 years later, and we're all grown up. Protagonist, Julia, played by Laura Regan (Dead Silence / Minority Report TV series) is friends with slightly deranged Billy, who promptly kills himself after announcing that he was marked by "They" when he was younger. This turns the narrative to Julia, and Billy's other friends, Sam and Terry, and allows them to decide whether there is a monster in the closet, or if Billy's psychosis has, well, rubbed off on them. Directed by Robert Harmon (The Hitcher / Nowhere to Run), the film is deeply atmospheric. It's true to say that there are some standard horror tropes - running up the stairs, not running away, being stupid - but largely this is forgiven in the story telling. It relies on fear, not jump scares. The acting is pretty decent all round (particularly creepy artist, Sam). The special effects are extremely well used. Underlying CGI, which isn't great is hidden in darkness and shadows with great effect. All round this is a good film. It scares. It's intense. I'd like a sequel, to be sure, and definitely check it out.